Females indeed seemed to rule in the latest episode of Hannibal, an aspect enhanced by the episodes’s title “…And the Woman Clothed with the Sun.” The title is also a continuation of the title of the previous episode, and the name of the painting responsible for The Great Red Dragon’s obsession. Some interesting relationships having to do with several of the show’s female characters were explored for this ninth episode of the season, with both old characters returning and new characters being introduced. As heavy on the character of The Red Dragon as the last week’s episode was, this entry has far less of him, but everything was still about him and the continuation of his storyline as it affects other characters’ lives. Beginning with Will Graham and Hannibal Lecter reuniting after three years, the episode continues the conversation they started at the end of “The Great Red Dragon” at the Baltimore State Hospital for the Criminally Insane. 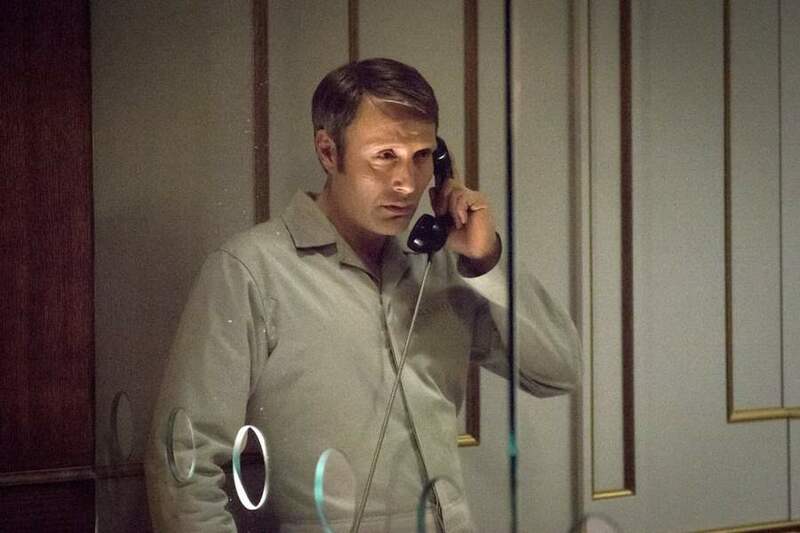 A lot was said during this scene, but with these two actors – Mads Mikkelsen as Hannibal and Hugh Dancy as Will – hardly anything needs to be said when they are on screen together. They can tell the story of their relationship and their feelings towards each other (if it sounds like I’m talking about an actual relationship, I basically am) with just their eyes and facial expressions. Though the scene was just cutting back and forth between over-the-shoulder shots of Hannibal and Will, director Guillermo Navarro wisely chose to always show the other person’s reflection in the glass wall of Hannibal’s cell in each shot so that we can see each person’s reactions. Hannibal’s affect in this scene is much harsher towards Will. It’s hard to tell if he’s hurt by what happened between them, or trying to push Will away from becoming involved with killers again because he knows how it will effect him. Honestly, I could believe either one. An unexpected aspect of this episode were the flashback scenes of Hannibal and Abigail Hobbs. Audiences got to see some important scenes from the previous two seasons replayed with more information revealing Abigail’s involvement. The wonderful scene of the two of them from season one where Abigail asks Hannibal if he is going to kill her is continued, showing that she helped him fake her own death before going into hiding with Hannibal and being groomed by him, almost like she was with her father. There’s a very grotesque but emotional moment where Hannibal presents her with her father’s corpse and she cuts his dead throat with his own knife. As the yellow embalming fluid leaks out of his body, Abigail experiences a real emotional release. Hannibal’s complex character makes it hard for me to tell for real if he actually cared about helping her, like Will did, or if he was only just using her and manipulating her the whole time. Abigail is the most tragic character on the show, and nothing that has ever been revealed about her life has made me feel better about what she had to endure. She simply never had a chance in life – first with her father, and then with Hannibal. Alana Bloom’s role this time around is a bit smaller but she is still shining so much more than she ever did when the show first started. Through most of season one, it seemed like her only role was to worry about Will, when it was obvious that the actress, Caroline Dhavernas, was capable of so much more. I can’t say I necessarily like the new Alana, as she is often quite off-putting and cold, but she is definitely stronger and more powerful. She reveals to Will in one scene that she is still with Margot Verger and that the two of them are raising the male Verger heir that Mason always wanted. Alana was even the one to carry the child. She reversed the roles in her and Hannibal’s relationship, lording over him at the hospital. In a scene that shows she still has concern for Will, she threatens Hannibal (as Dr. Chilton originally did in other incarnations of the story) by saying that she will take away his books, his drawings, and his toilet, leaving him to feel the one thing she assesses he fears the most – the feeling of indignity. The only thing that still remains to be seen is whether or not Alana is actually happy with her new life or herself. The only person who hasn’t changed a bit from the moment we met her is the despicable Freddie Lounds. She’s still just as annoying as ever, without a single discernible shred of empathy for other humans. At the same time, though, it’s almost comforting not to have to deal with another character with constant moral complexities. The things Freddie does often seem more steered toward her own agenda – whatever fame she’s looking to gain through working as a sleazy tabloid journalist – but perhaps she just thinks she’s helping the case in her own way. It may sound harsh, but maybe she’ll die by the end of the season like her character is supposed to – though obviously not in the way presented in the book or the movie, because that was already used previously to fake her death. Freddie is no different than she was before and offers nothing to the story emotionally, so while she’s interesting in a love-to-hate-her kind of way, she’s fairly expendable. Of course, the newest female member to the cast is Francis Dolarhyde’s blind co-worker Reba, with whom he forms a special bond. Francis finally gets to speak in this episode, revealing that he has a speech impediment caused by his cleft lip. When Francis and Reba meet for the first time, neither one of them acknowledges the other’s disability, which Reba later says is what immediately endeared him to her. Reba cannot see the cleft lip that causes him embarrassment, and her complete lack of fear or distaste for him, and her unending kindness, truly affect Francis. He can feel comfortable with her and not hide his outward insecurities. In return, she doesn’t have to feel any pity for her blindness, and this seems to be very important to her as having the job at Gateway was her first step to actually living in the real world by herself. 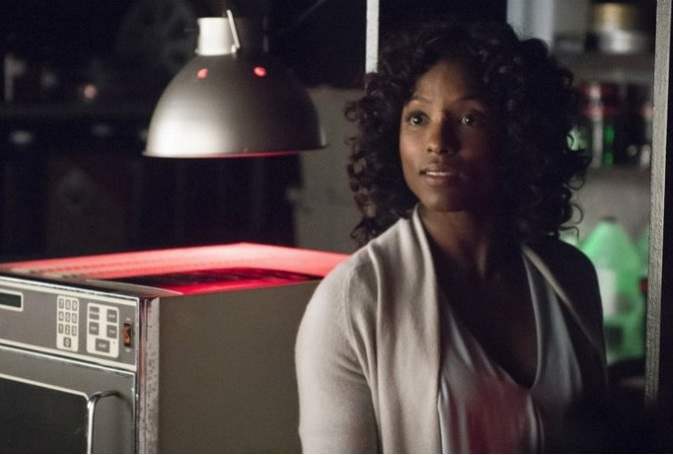 Rutina Wesley portrays Reba with equal parts confidence and hesitancy, two qualities she will need in furthering her relationship with Francis. Another great scene worth mentioning is the one that starts with a quick introduction of Francis’s grandmother during an awkward flashback dinner scene. This is juxtaposed with Will’s examination of the Jacobi crime scene and him imagining them having a fun birthday gathering together at the dinner table, which is then juxtaposed with a scene of Francis watching a video of the Jacobi murders. Francis then starts writhing around as the Red Dragon starts to get to him, and he actually imagines that he has grown a large tail. The music was not as noticeable in this episode, but the visuals, like this one, were definitely important in helping to really set the scene. All in all, “…And the Woman Clothed with the Sun” was not a particularly stellar or stand-out episode, but it was a wonderful character exploration that answered a lot of questions and revealed a lot of information about several characters in a short time.